Nine members of Caithness Gymnastics Club Rhythmic Team attended the Scottish National Gymnastics festival for 2009 held in the Magnum Centre, Irvine from the 1st to the 3rd of May. The Caithness team travelled to Irvine in Ayrshire on Friday 1st May to attend the Scottish National Gymnastics festival for 2009. The Audience watched as over 1500 Gymnasts, in 59 teams from all over the UK, displayed their spectacular Gymnastic talents and abilities with routines of many different varieties. The Caithness team of Rhythmic Gymnasts performed a truly breathtaking routine, one of only two Rhythmic teams at the festival, the other coming all the way from Birmingham. The Gymnasts truly deserved their commemorative medals presented on the last day of the event and are looking forward to the next one. 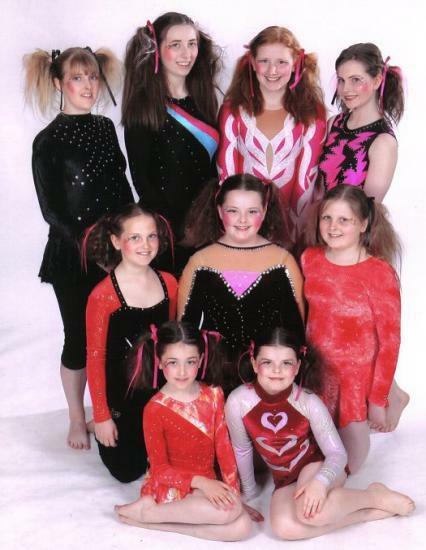 Caithness Gymnastics Club�s Rhythmic Gymnastics Section has 4 new Assistant Coaches! Gemma Wares, Sine Hamilton, Hanna Lalmahamode and Julie Simpson all undertook and passed the 1.5 hour practical exam in Thurso High School on Saturday morning. All 4 attended a coaching course in West Lothian last year which was funded jointly by the club and a Caithness Sports Council Grant.